Our customised oral vaccines may provide just the help you need! This page explains what we need to prepare the vaccine for an individual dog or cat, provides advice for the owner on how the vaccine should be given, and summarises an approach to the diagnosis and treatment of chronic diarrhoea. Diarrhoea in dogs and cats can be persistent and worrying for pet owners. There are many potential causes, from relatively harmless to more harmful resulting in weight loss or failure to grow. Veterinary investigations may encompass faecal analysis for parasites and pathogenic bacteria, and blood tests for diagnosis of pancreatic and intestinal disorders, as well as ruling out diseases of other body systems. In some cases, visualization and biopsy of the gastrointestinal tract may be helpful, using imaging such as radiography or ultrasound, and obtaining samples by endoscopy or surgery. Treatment will depend on the diagnosis, and may encompass diet change, oral pancreatic extract for animals with pancreatic insufficiency, injections to correct vitamin B12 deficiency, and drugs to treat parasites or bacterial pathogens, or to modify the resident gut bacteria and suppress gut inflammation. It is increasingly clear that gut bacteria play a key role in development of diarrhoea in many cases. We have taken the direct approach of making customized oral vaccines using the intestinal bacteria from that animal. Our oral vaccines have been used successfully to manage a spectrum of chronic gastrointestinal diseases in dogs and cats. Our detailed follow-up of 89 dogs showed an effective response in more than 70% of cases. “I am writing to thank you for the excellent service you have given and continue to give me and my dogs. I was at a loss as to what to do with my dear Bernese Mountain Dog, Rupert, when he was losing weight, had diarrhoea, vomiting and general malaise. I had tried numerous antibiotics, various diets and all sorts of other things to help him and truly thought he was close to death. I discovered BattLab on the Internet and my Veterinary Surgeon very kindly liaised with you regarding Rupert’s condition and current treatment. 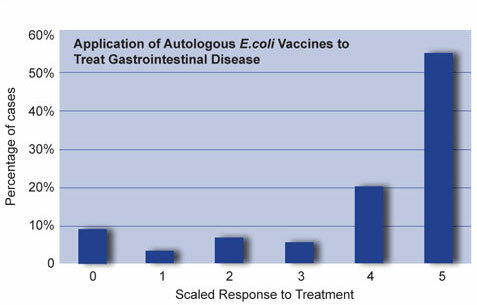 BattLab suggested a bespoke oral vaccine (E.coli) which may help him. I have now been using this vaccine for more than six months and am delighted to say that the improvement in Rupert and his general condition is immense. He has gained weight, his coat is beautiful and the vomiting has stopped completely. He is also on medication from my Veterinary Surgeon and specific diets, but when I stop the vaccine the vomiting and weight loss return. “I am writing to thank you for the excellent service you provide for me and my dog. I had been having terrible trouble with my dog ‘Willber’ and his various tummy troubles. I didn’t seem to be able to get to the bottom of the problem. Then a friend mentioned an E.coli vaccine which was produced by yourselves. Visit our Gastroenterology pages for further information on diagnosis of gastrointestinal disease. To order a vaccine, simply print out our request form and send this to BattLab with a small faecal sample and a Veterinary Prescription, using our freepost label.